James E. Littlejohn, MD, PhD1, Licia Gaber-Baylis, BA1, Madhu Mazumdar, PhD2, Stavros G. Memtsoudis, MD, PhD3, Peter M. Fleischut, MD1. 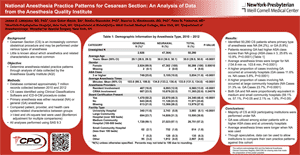 "National Anesthesia Practice Patterns for Cesarean Section: An Analysis of Data from the Anesthesia Quality Institute." 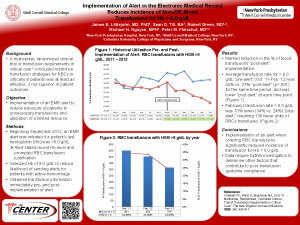 American Society for Anesthesiologists, October 2013. Peter M. Fleischut, MD1, Licia K. Gaber-Baylis, BA1, Susan L. Faggiani, RN,BA, CPHQ1, Madhu Mamzudar, PhD2, Stavros G. Memtsoudis, MD, PhD3. "National Anesthesia Practice Patterns for Ambulatory Meniscectomies: An Analysis of Data from the Anesthesia Quality Institute."" 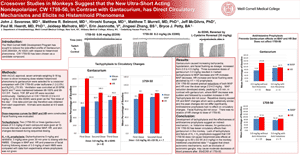 American Society of Anesthesiologists, October 2013. 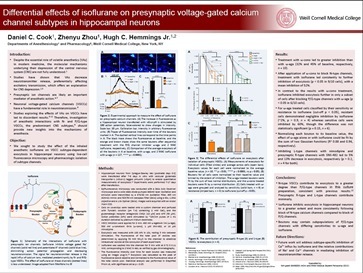 1 Department of Anesthesiology, Weill Cornell Medical College, New York, NY, 3Albany Medical College, Albany, NY, 2 Cedarburg Hauser Pharm, Inc.
Peter M. Fleischut, MD1, Licia K. Gaber-Baylis, BA1, Susan L. Faggiani, RN,BA, CPHQ1, Madhu Mamzudar, PhD2, Stavros G. Memtsoudis, MD, PhD3. 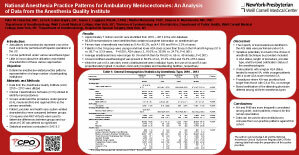 “National Anesthesia Practice Patterns for Ambulatory Meniscectomies: An Analysis of Data from the Anesthesia Quality Institute.” American Society of Anesthesiologists, October 2013. JJ Savarese, MD, H Sunaga, MD, MR Belmont, MD, MT Murrell, PM Heerdt, J McGilvra. 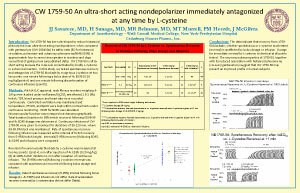 “CW 1759-50 An ultra-short acting nondepolarizer immediately antagonized at any time by L-cysteine.” AUA 2013. 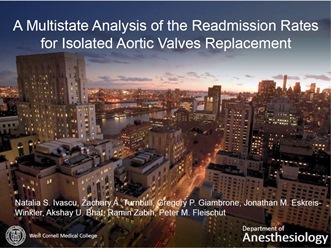 Natalia S. Ivascu, Zachary A. Turnbull, Gregory P. Giambrone, Jonathan M. Eskreis-Winkler, Akshay U. Bhat, Ramin Zabih, Peter M. Fleischut. 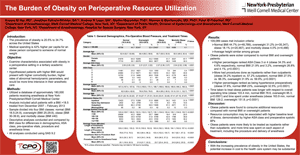 Society of Cardiothoracic Anesthesiologists, New Orleans, Louisiana, March 29-April 2, 2014. Zachary A. Turnbull, Natalia S. Ivascu, Gregory P. Giambrone, Jonathan M. Eskreis-Winkler, Akshay U. Bhat, Ramin Zabih, Peter M. Fleischut.